As most of you know, a health savings account or HSA is one of my favorite investment vehicles of all time. It’s the only investment that allows for triple tax savings – the money you put in isn’t taxed, the money you take out isn’t taxed and the earnings aren’t taxed – as long as you spend the money on qualified medical expenses. If you’re the perfect specimen of health by the time you retire, you can withdraw the funds in your HSA just like you would with a normal 401(k) or traditional IRA. I would argue that HSA’s should be maxed out as soon as you’ve contributed enough to get your 401(k) company match since they can be invested just like regular retirement accounts. There’s really no risk to over-contributing either since your HSA acts like a regular pre-tax retirement account for non-medical expenses. I’m obviously all for HSA’s but there are still many who are too stuck in their ways to see the light. I know it’s hard to make changes if you’re comfortable or happy with what you currently have. But in order to succeed in business or even life in general, you need to be open and willing to look at new things and embrace change. I’m going to use my employer’s plan as an example but you can apply the same comparison techniques that I use below to determine if an HSA is right for you or not. Spoiler alert: it probably is. My new company has over 170,000 employees so it makes sense that they offer the HSA/HDHP option to employees. In fact, they’re pushing it pretty hard since it probably saves them a ton of money. I’ve read articles in the company magazine, gotten e-mails from HR, and there’s even a special section on our website that talks about all the great benefits of the HSA/HDHP option. In exchange for signing up for the HSA, my company offers an employer contribution to the HSA and reduced premiums. They will give $600 to anyone willing to sign up for the HSA/HDHP plan and the premium is $0/month. My last employer only gave $500 and had a monthly premium of $26 for the HSA option so I’ll take the extra $100 and the reduced premiums. If I go for the traditional medical plan with my new company, the monthly premium would be $21/month. At my last employer, the deductible was $3,000! My new company generously gives us a $1,250 deductible which is actually the lowest amount allowed by law. Any lower of a deductible and the plan would not qualify to be paired with an HSA. The traditional plan comes with a $300 deductible but you have to remember that co-pays generally do not count towards deductible. So just based on the deductible and premiums alone, the HSA is a no brainer. If you go with the HSA/HDHP option you’ll be saving $21 per paycheck in premiums plus you’ll get an additional $600 contribution from the company. That’s a total of $1,146($600 + $21*26) in free money if you go with the HSA/HDHP option. Essentially, your deductible for the HSA plan would be almost free. Keep in mind that with the traditional plan, you would still have a $300 deductible. With that plan, office visits and specialist visits are generally covered with a co-pay but once you require an x-ray or additional testing, you will have to pay for everything up until the deductible. Once you reach the deductible, you would pay co-insurance up to your out of pocket maximum. Here’s an example of how my employer’s traditional plan would work. Let’s say your shoulder has been hurting so you go to your primary care doctor for a visit. You would pay a $20 co-pay for the visit but that doesn’t cover any additional treatment. If he orders an x-ray, there is 10% co-insurance after the deductible is met. So you will have to pay for the full cost of the x-ray which very well could be $300 the way diagnostic tests are priced these days and then you would pay co-insurance for anything after your deductible. As you can see from this example, once you hit your deductible you’ll still have to pay, but you’re basically getting a 90% discount since your co-insurance is only 10%. If the same thing happened but you had the HSA/HDHP combo you would have to pay for the full cost of the office visit(probably in the $100-$150 range) and you would pay the same price for the x-ray(assuming it was less than $300). So you’d be paying more for the visit but remember that you got $1,146 free so you haven’t actually spent a dime yet. It might seem like a pretty good deal to only have to pay $20 every time you want to see the doctor but you’re paying for that privilege with a much higher premium. Not only do you have to pay $21 more per paycheck but your employer is probably paying hundreds more on your behalf too. And if your employer’s medical costs are going up, it will definitely be reflected in your lower salary or lack of bonus. Choosing the HSA over the traditional plan will give you $1,146 in free money. Since you can also contribute money to an HSA on a pre-tax basis, every dollar you spend after $1,146 on medical care will be tax free. That could mean that you’re receiving a 20-50% discount on your healthcare depending on your income since these contributions would be coming out of your marginal tax bracket. Two of the things that scare people away from HSA’s are the high deductibles and out of pocket maximums. I’ve already shown that the deductible favors the HSA and now I’m going to show the same thing for the OOP Maximum. Since we’re getting $1,146 in free money, if there was a catastrophic event and you racked up tens of thousands in hospital bills you would only be on the hook for a total of $2,850 with the HSA/HDHP option. Since we get $1,146 free, that would leave us to cover the rest: $1,704. Compare that number to the out of pocket maximum for the traditional plan($2,000) and you could actually be on the hook for more money going with the traditional plan. Not to mention that the $1,704 would be tax free while the $2,000 would have to be paid with after tax dollars(if your medical expenses are greater than 7.5% of your AGI, then they would be tax deductible for traditional plan holders). I think the clear winner here is the HSA/HDHP option. Normally HSA’s make sense if you’re young and healthy, but here it would probably work out in your benefit 90% of the time. I really lucked out this year, my company offers a great health plan and with the HSA, I’ll be able to save a thousand dollars a year, plus contribute another couple thousand. Since the deductible and OOP max are so low, I’m able to get the same tax deferred savings but with way less risk(my last plan had a 5k OOP max!). 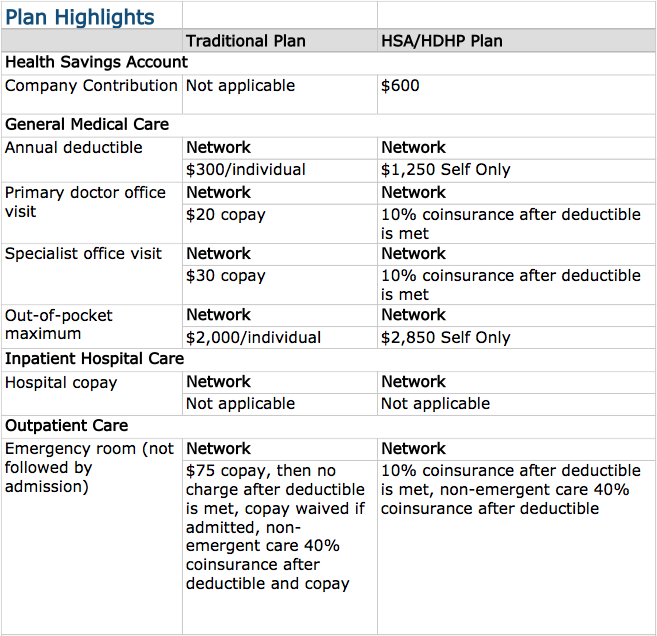 Readers, what do you think about my new company’s HSA plan? 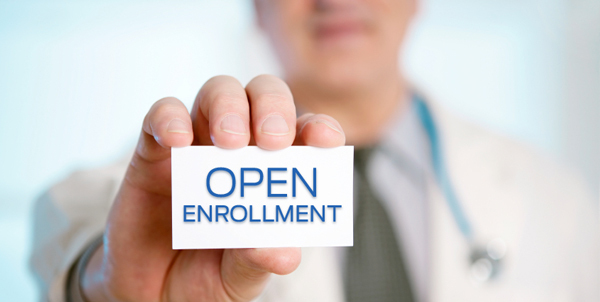 Why would anyone sign up for a traditional plan here when the HSA is so clearly incentivized? Yep, that’s exactly why I went with my HSA/HDHP plan as well. I have to pay premiums, but they’re pretty small and it’s definitely a no brainer. You have a great plan! Even with the amount of health costs I’m ending up with this plan year, it’s still way cheaper to have gone with the HSA/HDHP one. Yea I don’t know why my new company doesn’t just lay out the math like I did. They make the HSA/HDHP option so attractive but people don’t want to take risk with their medical plans. There’s no risk with the HSA for me even though I probably would have gone for it regardless. Wow, those are some great deductibles! My company offers a PPO with a $1000 deductible and an HDHP with a $2750 deductible, and our benefits are considered very good for our area/industry! Haha yea I know, 1000/2750 is definitely pretty good. I think the middle ground where PPO’s make sense though is just so small it seems like I would always go with an HSA. What do you have? More health plans will probably turn to HSA plans in the future. Where I work, we’re part of a larger, catch-all union (we’re the only private school that’s a member) so we get very affordable rates because the union bargains on our behalf (I do pay $12 out of each paycheck towards dues). If they can’t keep bargaining rates like we have, I wouldn’t be surprised if we get an option like you go for. Oh nice, that’s a good deal. I have no idea why every company in the US hasn’t switched to HSA’s. Why even give employees the option? Insurance should be for the big things and you should pay for the small things – thus eliminating the middle man and the extra cost. I have worked with groups that offered HSA’s and paid for supplemental insurance to help employees with fear of the deductible. Most of the older employees go with the traditional plans, and the young single guys (who never go to the doctor anyway) take the HSA and get an accident plan for free. That’s why I started doing the HSA but now I’ve realized that HSA’s are often better even if you do go to the doctor quite often. My plan is an extreme case but you’re totally right. Most people have an irrational fear of the deductible and that’s why they shy away from HSA’s. If they just looked at the employer contribution and/or the monthly premium savings though they’d probably change their mind..
Our company went from heavily pushing the HDHP/HSA plan last year to only having the HDHP/HSA this year, but in no case was the other option ever cheaper, people were just attached to their PPO. I think the biggest disadvantage to the HDHP/HSA for most people is they don’t have the savings to pay the deductible up front at the beginning of the year. Yea people definitely get attached to their PPO’s. I hear that reason over and over but the great thing about HSA’s is that it doesn’t matter if you don’t have the deductible up front. As long as you can pay for it with some other funds, once you have enough in your HSA you can retroactively pull it out to cover expenses that occurred any time in the past! I signed up for the HDHP/HSA a year ago at my company and so far it’s been great. We started off using the HSA to pay for things like glasses and dental visits before I realized the true nature of the HSA and its triple tax benefits. Now we pay all expenses out of pocket and leave the HSA alone. To me, using money out of the HSA is really no different than withdrawing it from our Roth IRA. Nice, yea that’s the perfect analogy actually. The money you spend with your HSA is just like Roth contributions since you can withdraw at any point in the future completely tax free. The only tough part is going to be withdrawing the actual money sometime later on haha. Just make sure you keep good records of purchases/receipt scans. I’m very curious as to what will happen if/when I take out $20k out of my HSA and don’t have to pay taxes on it in 10 or 20 years! If we were healthy at our house the HSA would clearly be the better choice. Our only problem is that we’re not healthy. I figured out what the costs would have been last year in a HSA vs Traditional and because we were so unhealthy last year we would have paid $1000-1500 more with the HSA – even when considering the employer contribution to my HSA. So now we need to decide for next year, what will our expenses be next year? Traditional or HSA? You really need a crystal ball – especially with my family where we never know just how bad (or good) our health will be from year to year. Interesting stuff Peter, I’d be curious to hear more about your situation. If it was just a one time thing where you had a lot of medical expenses then HSA could still work over the long run since you can actually pay for HSA expenses out of pocket and reimburse yourself the next year. A lot of the people I’ve talked to also forget to take into account the difference in premium(on top of the employer contribution) and the tax deductible nature of every single purchase with HSA/HDHP. Ex: if you have a traditional plan and you pay for service(unless you have an FSA) that’s with after tax dollars but everything with HSA is paid with pre-tax. Could be a large difference depending on what tax bracket you’re in since it’s your marginal rate. Unfortunately this year was not an isolated case, my wife has a lot of health problems so from year to year our expenditures tend to be higher than the average family. We did have a FSA with our traditional plan last year and that did save us quite a bit on our taxes, but we could definitely save more with the HSA since it’s not a use it or lose it type deal and we can afford to put more into it without fear of losing it. The premium for the HDHP with HSA at my work is only slighly lower when compared to the traditional health plan, but the out of pocket maximums on the traditional are sky high. When we consider that my work is giving us $1000 as a family towards the HSA, and the lower maximums for the HSA, we may end up going with that anyway. Ah sorry to hear that, FSA has new rules this year which allow you to rollover $500 as I’m sure you know so that may help you out. I think HSA/HDHP is worth the risk but if you know you’re going to be using the insurance then a traditional plan may be the better deal. I happened to get very lucky since my HSA would actually be a better deal whether you spend very or little or a whole lot. I’m on the fence about HDP. I PAY $40 a month for my PPO with a $1000 deductible. My HDHP will cost nothing with a $2000 deductible with company contributing $1000. I usually see the doctor 4-5 times a year so I PAY at most $150 for doctors. The catch is in my medication I have some very expensive medicines that I only have to pay $10 with my PPO with a total of $340 last year. If I had a HDHP it would cost $3,500 so I would have to pay my complete deductible plus 10%. So with medication alone that’s $2150- my employer contribution = $1,150. With PPO total I’m paying $480 + 340 = $820. SO with that math I’m saving $330 a year with regular insurance. What do you think? Am I missing something or should I stay with my PPO? Hey Amber, did you have a significant life change(married/divorced/kid/etc)? Otherwise you usually can’t switch until annual enrollment which is around November or if you switch jobs obviously. Anyways, this should be a fun math problem, let’s figure it out! Your current PPO costs $40 a month($480/yr), you spend $150 on doctor’s visits and $340 on your medication. You also have a $1,000 deductible but co-pays/premiums can’t be applied to that. So in a given year, you spend $970 on healthcare and reach $0 out of your $1,000 deductible. $480 of that is tax deductible(premiums) and $490 is not(unless you have an HRA with your PPO?). So really you spent $490 after premiums. If you go with HDHP, you’ll get $1,000 from your employer and a $480 savings in premiums. So that leaves a shortfall of $520 in-between your deductible and ‘free money'($2,000-$1,480) assuming you contribute the premium savings to your HSA. I’m assuming your HDHP would give you 10% co-insurance once you hit the deductible, hence the meds cost would be $2,150. So now you’re out of pocket $670($2,150-$1,480). Normally you would have to pay for doctor’s visits out of pocket but since you already hit your deductible, they should be free(or at the worst 10% co-insurance). That $670 is tax deductible though and at a 25% fed tax rate, that’s about $170 in tax savings so really you spent $500. Compare that to the $490 you spent and both plans are nearly identical. Except for the fact that you hit your deductible with the HSA while with the PPO you were still $1,000 away. If you have extra medical care one year you’d probably be better served with the HSA since you would have already hit your deductible and be fully covered or only have to pay co-insurance(usually in the 10% range). I also like the HSA for you because you may be able to find that medicine for less than $2,150 for a year. This is a set-up. This article purely demonstrate how companies aim to post such an article to misguide those who are surfing online to find if HSA any better or not. This whole HSA stuff only benefits big companies and corporates. Forget about all the numbers, calculations, and examples being shared here. The bottom line is if your company only have HSA plan then pretty much you’re screwed. You will pay every month for nothing. This is more likely a car insurance where they want you to believe nothing will happen to your car. And if something goes wrong and if you’re at fault then they will cover you. However they won’t pay a dime for normal wear and tear expenses. This HSA scheme is exactly the same. Just keep paying every month but the normal wear and tear (doctors appointments) you will have to pay. They will only come and rescue you if you submit $10k (or whatever the deductibles) up front. Yea let’s forget about math for a second because that is a good way to objectively analyze a situation. You are a classic example of someone who does not understand how insurance works. The premiums you pay have to cover the treatment/services rendered, all overhead of the insurance company, salaries, advertising and any profit the company may earn. So by the laws of math, the AVERAGE person will get less than what they put into it. Oh crap, I forgot you don’t believe in math. Let me put it another way, you don’t want to involve insurance for routine exams or anything that you can afford to pay for out of pocket. Insurance is there to insure against the things you can’t afford, like a $200,000 open heart surgery.